The 2013 Mustang Boss 302 includes the new vented hood of the Mustang GT and grille design but continues with the tradition of blocked out fog lamps on a blacked out grille with tri-bar pony emblem. The blacked out rear spoiler, rear decklid panel and stripes remain as well as the Laguna Seca package which adds many more Ford Racing options. Race Red 2013 Boss 302 Mustang owned by Steve from Colchester, Vermont. It has the 302ci 4V V8 engine that's rated at 444hp. This is our featured Attitude Of The Week for the week starting June 24, 2012. Steve adds, "I recently purchased this new Race Red 2013 Boss 302 Mustang. It pulls hard in every gear and handles like a dream. The quad exhaust sounds fantastic and can increase side exhaust sound by replacing factory discs with larger diameter sizes. Steering feel can be adjusted using menu on LCD display and suspension firmness can be adjusted from 1 to 5 at all four corners. A blast to drive." Black 2013 Mustang Boss 302 Leguna Seca owned by Paul Jarosz from Lake Jackson, Texas. This is our featured Attitude Of The Week for the week starting February 24, 2013. It has the 5.0L V8 and and a manual transmission. Paul adds, "I've wanted a Boss Mustang since I was a kid, and the 2013 Boss 302 Laguna Seca is such an amazing car, I couldn't resist. The Ford engineers really created an outstanding road & track automobile that can compete with the Europeans which have much higher price tags. It's pictured next to my other 'Boss Mustang' - my convertible '07 Saleen Heritage H-281." 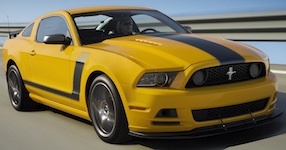 Ford promotional photo of the 2013 Mustang Laguna Seca Boss 302 coupe in a new Mustang color for 2013 called School Bus yellow. The 2013 Boss 302 includes the new vented hood and front grille but with blocked out fog lamps for that racing look. It also has the distinctive Boss 302 side stripe and front Ford Racing valance splitter. The black rear spoiler matches the stripes and blacked out grille.